CAPE CANAVERAL, Fla. (AP) — SpaceX’s big new rocket blasted off Tuesday on its first test flight, carrying a red sports car aiming for an endless road trip past Mars. Two of the boosters— both recycled from previous launches — returned minutes later for simultaneous, side-by-side touchdowns on land at Cape Canaveral. Sonic booms rumbled across the region with the vertical landings. There was no immediate word on whether the third booster, brand new, made it onto an ocean platform 300 miles offshore. SpaceX chief executive Elon Musk owns the rocketing Tesla Roadster, which is shooting for a solar orbit that will reach all the way to Mars. As head of the electric carmaker Tesla, he combined his passions to add a dramatic flair to the Heavy’s long-awaited inaugural flight. Ballast for a rocket debut is usually concrete or steel slabs, or experiments. Cameras mounted on the car fed stunning video of the convertible floating high above the ocean with its driver, a space-suited dummy, named “Starman” after the Davie Bowie song. A sign on the dashboard read: “Don’t panic!” Bowie’s “Life on Mars?” played in the background at one point. 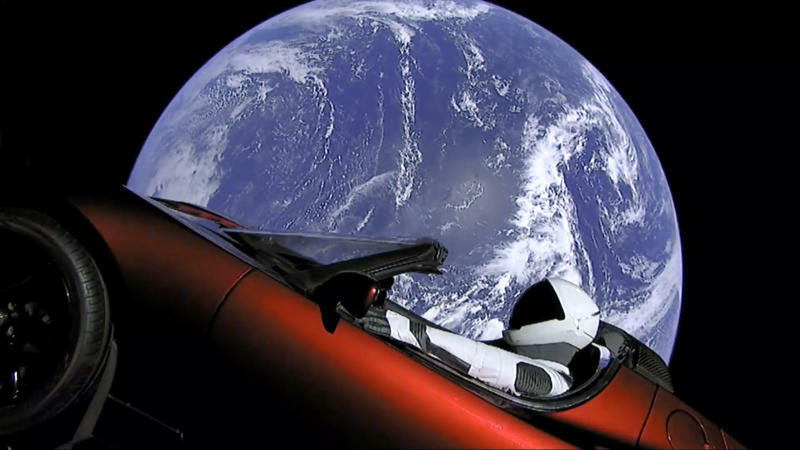 Minutes later, he provided a livestream of “Starman” tooling around the blue home planet, looking something like a NASCAR racer out for a Sunday drive, with its right hand on the wheel and the left arm resting on the car’s door. “If people think we’re in a race with the Chinese, this is our secret weapon: the entrepreneurship of people like Elon and others like Jeff Bezos,” said Stanford University’s G. Scott Hubbard, NASA’s first Mars czar. Amazon’s Bezos heads Blue Origin, which is developing a big, reusable orbital-class rocket and already is making suborbital flights in Texas.